Culled from the pages of last weekends Guardian, Ottolenghi's Polenta chips. It's an actual good thing to do with that box of fast cook polenta we all have lurking amongst the skeletons in our larder. If, like me, you bought a box of the stuff in the vain and misguided illusion that the infernal goop was anything other than just about tolerable, and are at a complete loss with how to hoodwink your loved ones into polishing off the perfidious stuff, then this is the recipe. It's an actual good thing to do with the stuff. And, it kinda mirrors Dhruvs cool fish and chip deconstruction on Masterchef. 60g of fast cook polenta. None of that standing by the pot for two hours stirring a thick pot of corny goo with forearms as thick as intelligent design for me. No. Fast cook is the one. 60g of cheese. I used a smoked gubbeen, mixed with parmesan, grated, to good effect. Smoked cheese, smoky chips. Seasoning, to taste. I used salt, lack pepper, and a little pimenton ahumado - smoked paprika, which really picked out and underscored the smoky note with all sorts of interesting extra tastes. Boil the stock. Add the polenta and stir. 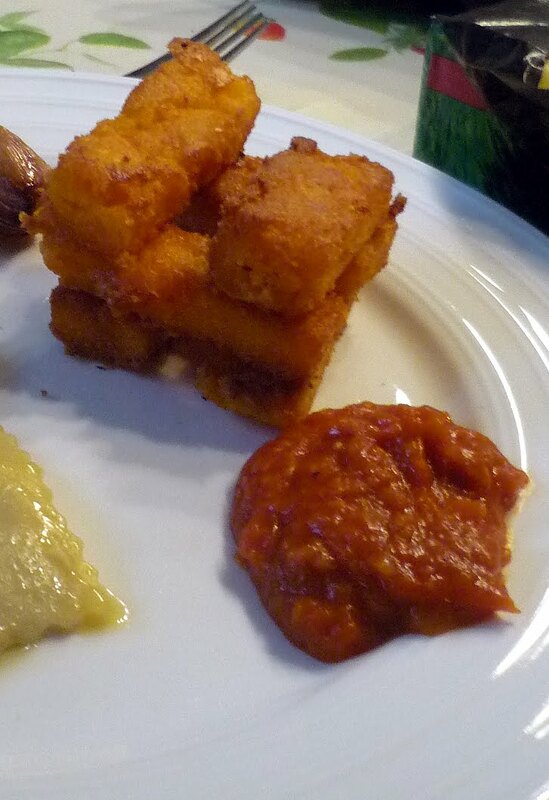 The polenta will spit like a trapped cat that hates you because you kick it. With boiling saliva. That glues stuff. By burning. Spread the polenta out on a cling filmed tray, about 1.5 cm thick. I tried to trim and straighten all corners and edges, and I think it's worth the effort, bot in terms of presentation, and becuase it makes handling them easier. Season, and mix in the butter and cheese, and leave to cool. After 30 minutes of so, cut the polenta platter into chips - I went with a 1'5cm thickness, and breadth, and varying lengths. Next time, I'll form it better to get uniform length chips. He recommends deep frying. Which I tried, and found frustrating and difficult - the chips broke up, or bound to one another, and were difficult to remove - the tongs was too indelicate a tool to use, and I may not have chilled my polenta enough. Also, deep frying, I think, would give that perfectly even colour and texture on all sides. So I shallow fried, and here's what I'd recommend if you choose to do so too. 1.Do small batches - they reserve, drain and crisp up well in the oven while you wait. 2. In the pan, don't let them touch - it's easy for them to bind. 3. A good layer of oil, and a non stick, or really good cast iron pan are a must. 4. Don't flip them until the undersurface is nicely browned - they're fragile until the crust forms, and they leach liquid and make the oil spit if you break them. When the crust forms, it's much easier to flip them. On max heat, on a small ring, it was about 60-80 seconds. 5. I used a fork, and a thin bladed knife to gently flip them over. I found a tongs too rough. 6. Pain is a quick teacher. The first couple of oil spatters gave my flipping a fast learned speed. I served it with a homemade ketchup, but I think next time I'll go with a mustard or garlic mayonnaise. Ottolenghi's book looks cool (and from reports the restaurant is fantastic). It's on my to buy list. Interesting recipes - with the occasional one that does not quite seem to work, but stuffed with all sorts of savoury and sweet concoctions that are genuinely fantastic. Posted by Keith at 11:10 p.m.